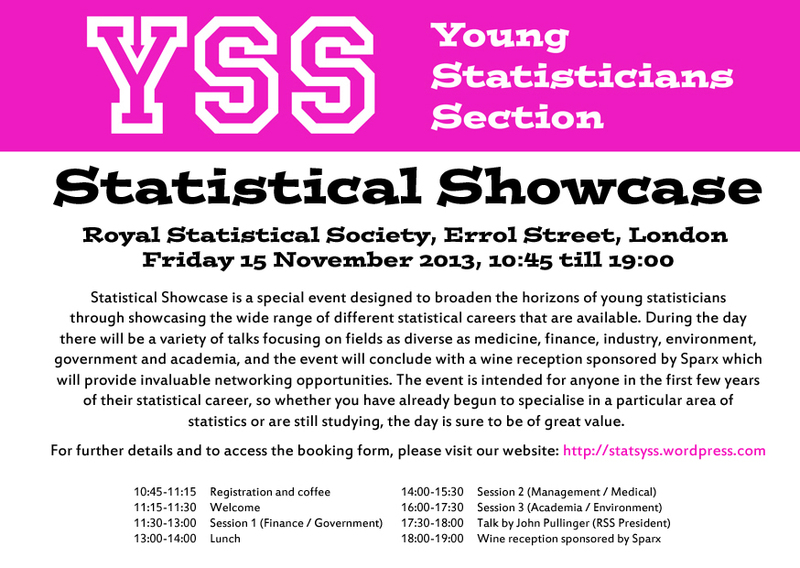 Join us for this special careers event to gain an insight into different areas of the statistical profession! During the course of the day, there will be speakers from the areas of Finance, Government, Management, Medicine, Academia and Environment. 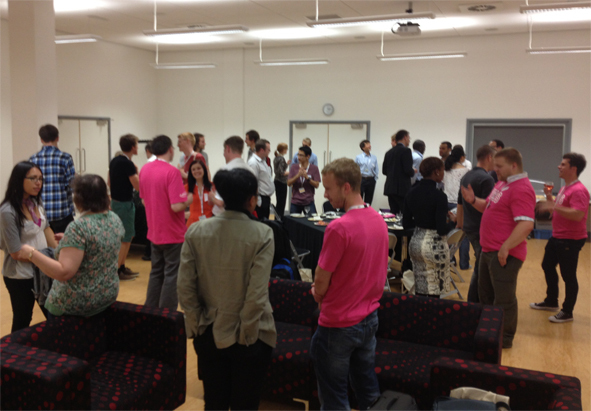 Despite our t-shirts being a somewhat upsetting shade of pink, the RSS 2013 conference in September was another resounding success for the YSS. Not only were there nearly 100 young statisticians among the 420 attendees, but the YSS committee were out in force, with Dan, Elizabeth, Jen, Matt, Orlaith, Rob, Simon and Tim all flying the flag for the section. Jen and Rob’s introductory session – “The Young Statistician’s Guide to the Conference” – went down a storm, with young statisticians from almost every field of statistics packing the room. After a brief introduction to the YSS, and some helpful words of advice on getting the most out of conference, the mic was passed over to the distinguished James Carpenter, who gave an illuminating and entertaining talk on his previous conference experiences. The session rounded off with an opportunity for attendees to plug their talks, including a memorable pitch from one enterprising chap who challenged us to come along and spot the rabbit hidden in his slides. Our Tuesday lunchtime social (powered by delicious free wine, courtesy of Atass Sports) brought together over 40 young statisticians, along with a drizzling of not-so-young ones for good measure. Tim’s icebreaker activity ran even more smoothly than in 2012 (partly due to a sturdy whistle taking the place of last year’s embarrassing makeshift gong), and over the course of the hour, each person got chance to mingle with almost everybody else in the room. All in all, a very promising start to our social programme. After enjoying an afternoon of heavy conference brainwork and the evening’s RSS Awards Ceremony, we descended on Pacific House (just down the road from the conference) to enjoy a buffet dinner and begin the festivities proper. Unsurprisingly, Newcastle offered a vastly superior nightlife to that of Telford the previous year, with some venues even choosing to remain open after 11pm. A small number of attendees (mentioning no names) took advantage of this fact perhaps a little too zealously, and awoke the next morning to a heady mix of euphoria and regret. Tut tut. Wednesday was officially our day off from YSS activities, though with such a packed conference schedule there was plenty to see throughout the day – including some top-notch presentations from the young statisticians who’d scooped prizes at the YSM and RSC conferences earlier in the year. After an excellent conference dinner over in the Great North Museum, the evening saw another YSS pilgrimage into the depths of Newcastle, much to the distress of those who’d prematurely pushed the envelope the previous night. Thanks to everyone on the committee for all their hard work before and during the conference, and to the RSS for organising such a cracking event. Roll on 2014!